You may know that YouVersion already offers hundreds of versions you can read in many languages, along with audio Bibles you can listen to as you’re doing other things. 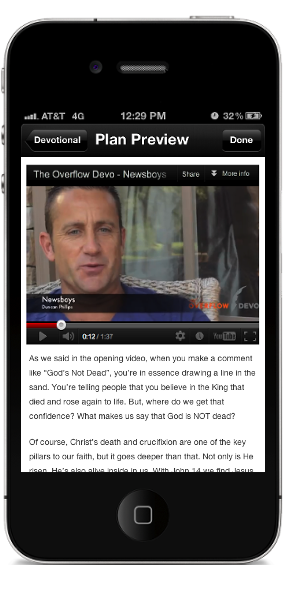 Now we’re also adding video devotionals you can watch on your mobile device and at YouVersion.com! The Overflow has graciously partnered with YouVersion to provide Video Plans from six popular Christian recording artists. Spend time with Scripture as you enjoy insight from gifted teachers, speakers, and now—musicians! While the video portion of these plans is available now exclusively on iPhone, Android, and at YouVersion.com (and coming soon to iPad! ), you can access the text portion on any mobile device where you use your plans. Try one now! They’re easy to find in the New Plans category. And whether you’re watching a video devotional, listening to an audio Bible, or checking out one of our Featured Plans, we hope all of these Plans help you continue engaging with the Bible! Previous PostPrevious Bible.com joins the YouVersion family!